Stand Up Desks are becoming very popular these days as people realize that sitting all day is not healthy for our backs and bodies. But electric lift desks can be expensive. There are alternative, crank desks, desktop risers, and more. 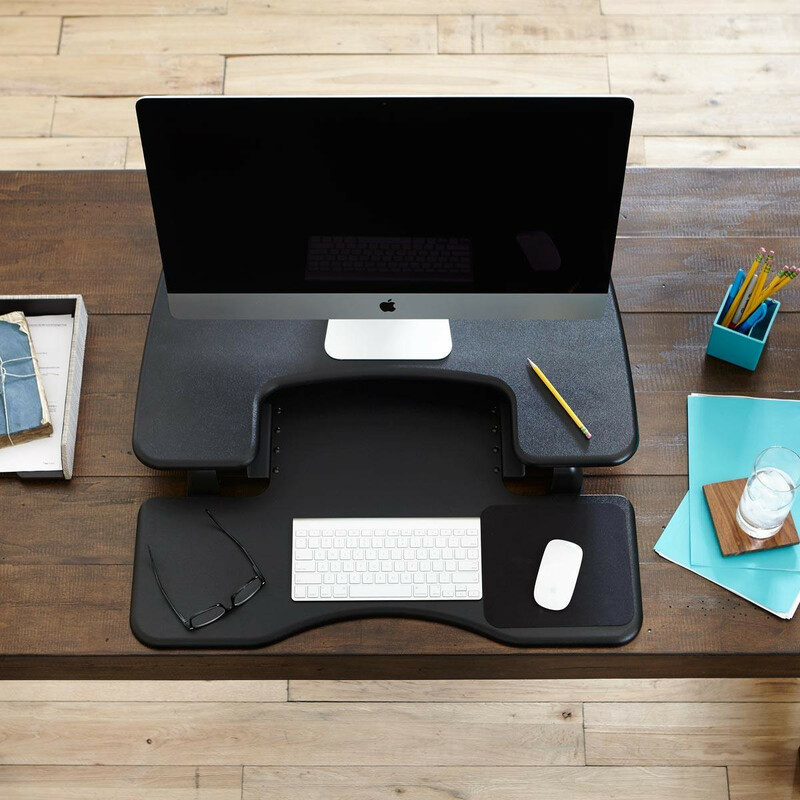 One alternative is the Varidesk. 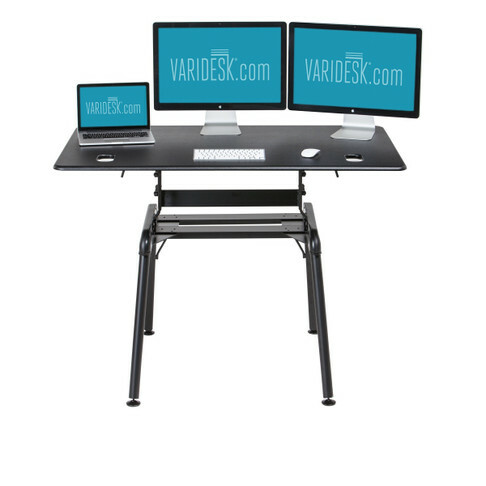 Varidesk offers a variety of options, A standing desk, a desktop riser for laptops, standing desks for those with multiple monitors and foot pads that help reduce strain on your knees when you stand for long periods. One reason I like the Varidesk is that it is relatively affordable, easy to set up (most models require no installation!) and most versions can sit on top of your existing desk. For those of you with one monitor, prices for the Varidesk models range from $275-375. For those with multiple monitors, prices range from $350-$650. Keep in mind, neither sitting all day nor standing all day is great for your back and body. Alternating between sitting, standing, stretching, walking (to restroom or short walks around the office) is optimal for your spine and overall health. I recommend that either program your phone or computer to cue you to change position (take a break sit if standing, stand if sitting) about every 30-45 minutes so that you don’t over tire your muscles and put too much wear and tear on any one body part. If I had my way, we’ve all have access to swimming pools/lakes near our workplaces so we could take short swimming breaks. But it would have to rain a whole lot more in Chicago for that to happen any time soon! 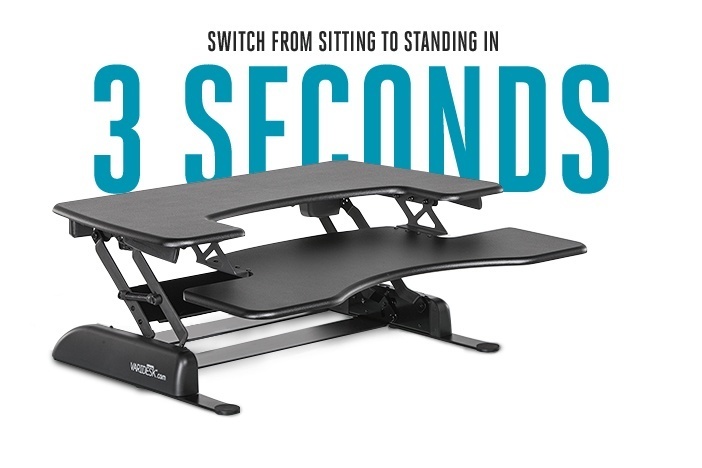 In the meantime, if you are considering investing in your own stand up desk, and don’t want to spend thousands of dollars, check out the Varidesk options here. Note: Neither, I , Sue Shekut, nor Working Well Massage, has any financial interest or relationship with Varidesk. (Other than I may become a customer.) I simply saw a Varidesk a ta client site and asked them where they bought it. I looked into the product and was impressed! And my clients seem to enjoy using them, which is the best endorsement.